Hi Lovelies! I was reeling to try liquid lipsticks If you are a follower in instagram, I have posted a photo of four different shades of liquid lipsticks from BYS and I got a bit of hard time which one to pick. I am into all shades because they are soo gorgeous. This liquid lipstick is available in six shades, if I am not mistaken. If only I could pick all of them, unfortunately I only had to pick one so I got the BYS Velvet Lips Liquid Lipstick in the shade 05 Lily Vibrant. This is my first ever matte liquid lipstick and my first ever try of BYS brand so I totally had my hopes up from the very beginning. 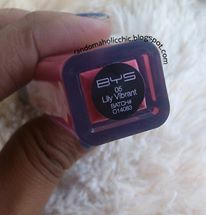 I have seen great reviews on BYS products and I guess their products are in excellent quality. I was squealing in excitement to try it right away and share my thoughts, so here comes the review! 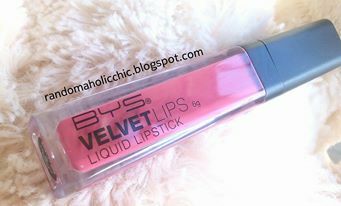 For irresistible, kissable lips with a vivid color, try the Velvet Lips Liquid Lipstick from BYS. This highly pigmented, creamy, long wear formula, glides on easily. The formula dries to a smooth matte, velvet finish and rich in color. It comes in a transparent, and high-end looking glass tube packaging with black plastic cap where the doe foot applicator is attached. The packaging feels and looks sturdy, and gladly has very tight cap which is impossible to come off in my purse. The shade is a coralish warm medium pink which I find perfect for office wear or even when you are just running errands. This is the kind of shade that is totally right up my alley. This liquid lipstick is unscented, hooray! The color in the tube is the exact shade you get when applied on lips. The doe foot applicator has enough length to give precise application of the product on lips. 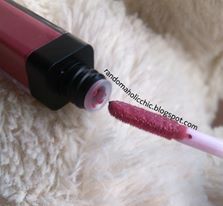 Prior application, I basically stretch my lips to make sure that the product will cover up even the lines of my lips and apply a thin layer all over. Then, I need to wait a couple of minutes to let the product set. And once it dried, I apply another thin layer making sure that my lips is 100% evenly covered. 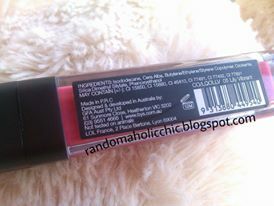 It has a creamy texture yet easily applied on lips. It dries completely matte and has outstanding pigmented color. 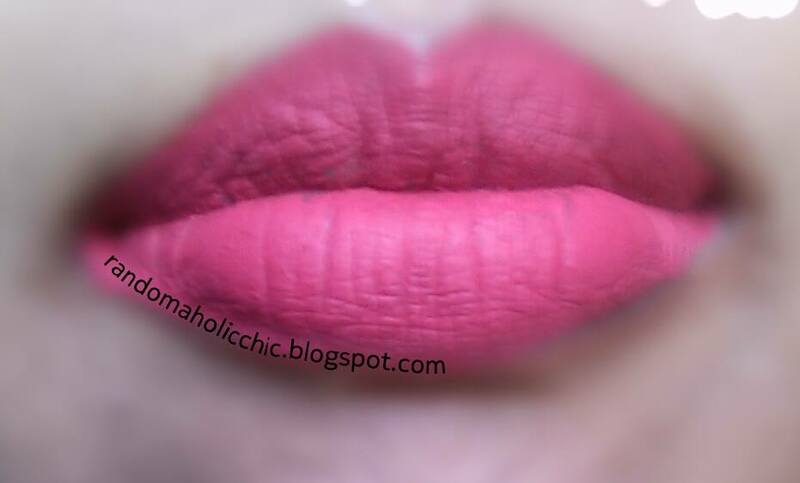 Since it is matte, don’t expect it to be moisturizing because it is actually a bit drying. I did a kiss test on a paper and it doesn’t transfer. 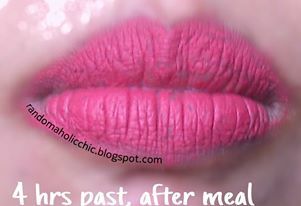 I had my lunch after four hours and the photo below shows how my lips looked like after. I had to touch up because it doesnt look as good anymore. The inner part of my lips fade off first. When I had to touch up, it still glides on smoothly. I really love everything about this liquid lipstick, the pigmentation, staying power, weightless, not too drying, and wonderful color. Yes, this is long-wearing lip product and definitely lasts whole day, but when some parts start to wear off, it looks patchy and no longer look presentable after 6 hours (without eating). I did not exfoliate my lips prior applying the lipstick, nevertheless I did apply lip balm. I am disheartened, maybe if my lips could have been more hydrated, I guess the product wont smudge easily at some parts. The color at some parts of my lips did not come off, and the next morning my lips were a bit rosier than normal. And when I tried to rub the back of my hand to my lips, a bit of lip color transferred. Just a little tip, to prevent lip colour from feathering past your lip line, try to use lip liner prior applying your liquid lipstick. Also, don’t forget to exfoliate your lips first, it helps a lot to prep your lips so when it it won’t appear patchy.